Le Binchotan has been around for awhile now, but the new chef-owner, Jeremmy, who have had stints at Iggy's and Sola, has refreshed things, injected more goodness into the food, and is bringing even more to the table. The name Le Binchotan is a combination of a French word, and a Japanese word, and this captures the essence of the restaurant perfectly. 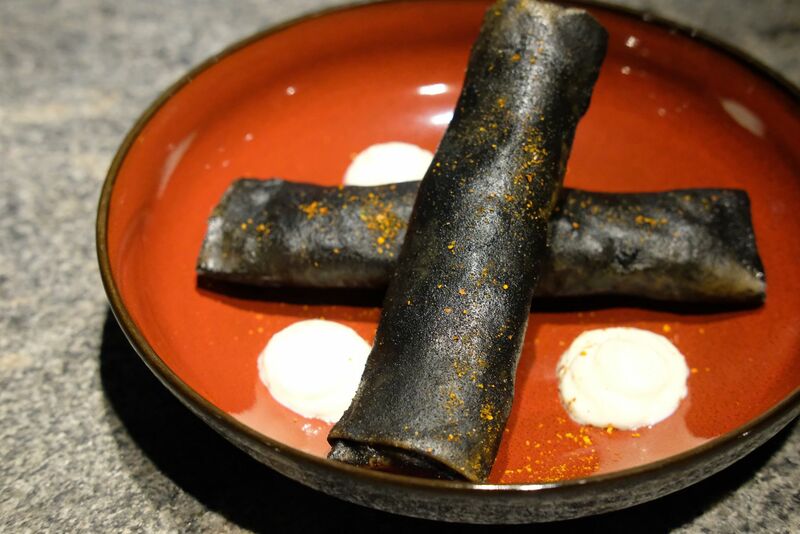 The restaurant specialises in Japanese-French flavours that are elevated with a trademark smokiness that can only be achieved with the use of binchotan, a rare and expensive charcoal. 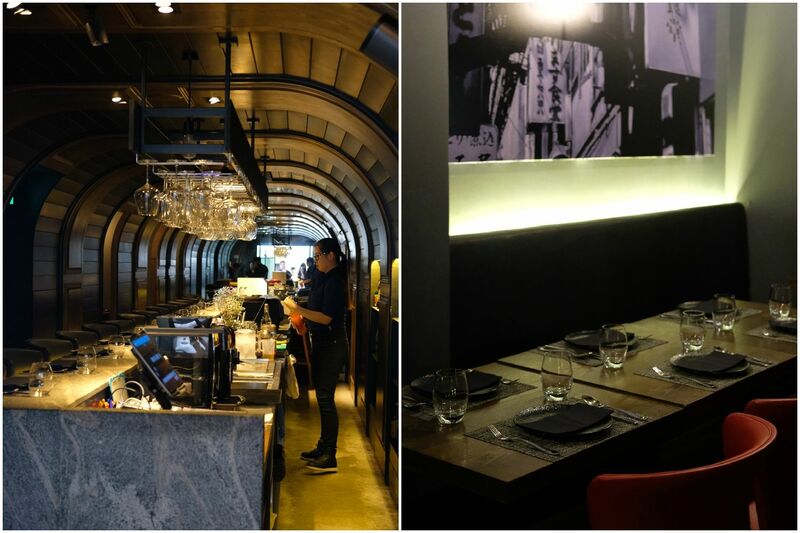 The interior of the restaurant resembles the inside of a train. There are private rooms for those who are dining in bigger groups. 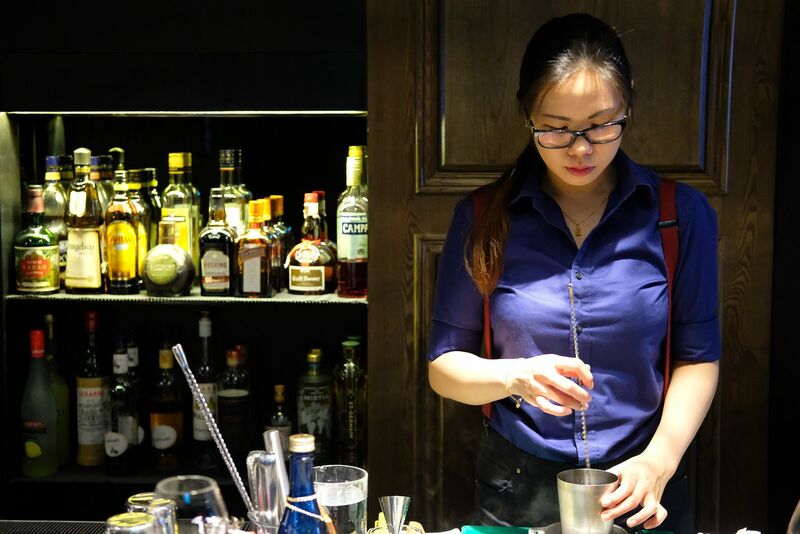 The cozy restaurant allows you to interact with the bartender and mixologist, Gwen, who customizes cocktails according to your preference. Gwen will ask you a series of questions, such as what was the last thing you ate or drank, and what kinda base you prefer. She made an off-the-menu drink called Purple Dream for me, and I loved it to bits. The cocktails here are incredibly creative, and refreshing. Le Binchotan also has quite an impressive list of wines, and sakes, if those are more up your alley. 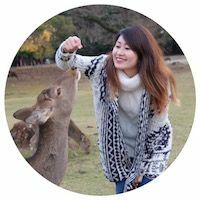 For those who prefer something non-alcoholic, matcha latte, houjicha latte and royal milk tea are available during lunchtime. Purple Dream(off-the-menu) is inspired by one of Gwen's dream where everything was purple. 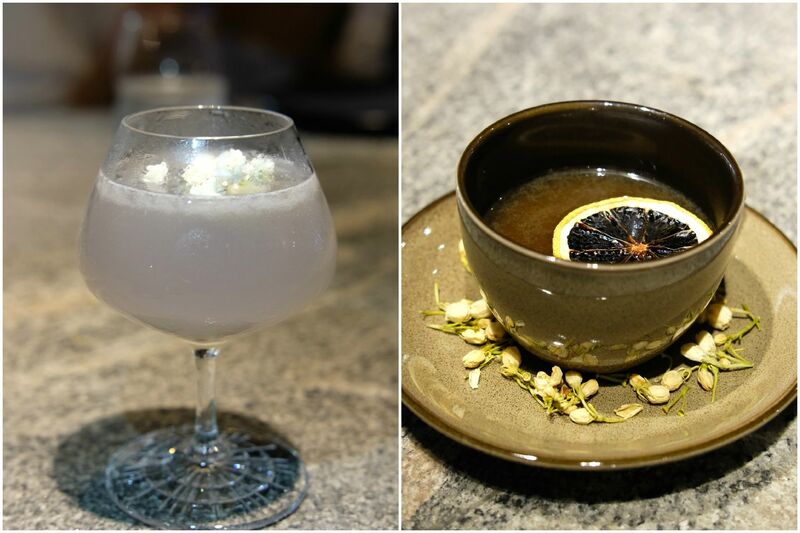 Rice "Tea" ($20) is a hot cocktail that will whet your appetite with its citrusy notes. The Signature Le Binchotan($23) embodies the character of the restaurant, cleverly incorporating charcoal in its creation. A huge cube of ice with a debossed 'Le Binchotan' sits in the drink. The Floral Enchantment($22) tastes like the hi-chew grape sweet (which is just what Gwen wanted)! The Iced Royal Milk Tea($7) was a little too sweet for me at first, but it grew on me after a few sips. I guess you have to wait for the ice to melt a little. Bread and butter would be the downfall of me someday. 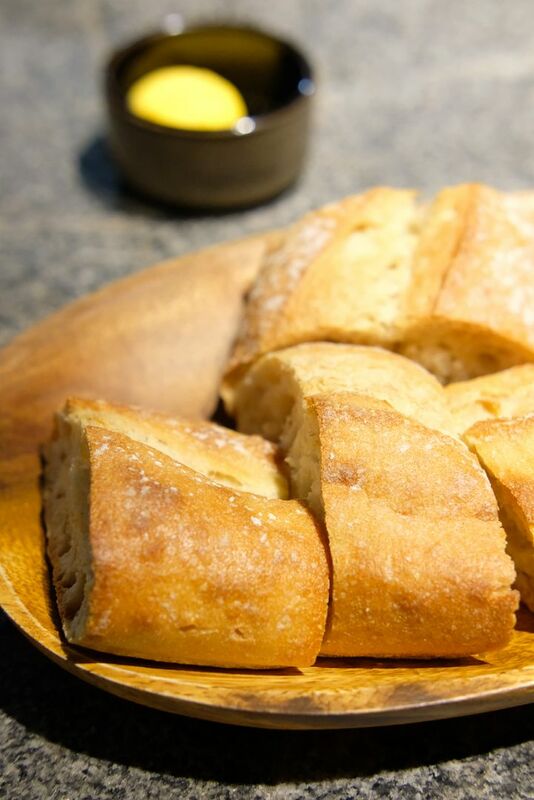 The fragrant bread at Le Binchotan, which was already enjoyable on its own, was made even better with a slather of their house-made butter. The black and dark yellow butter is made from charcoal powder and sea salt (black part) and butter blended with carrot puree(yellow part). I used one blob of butter for one piece of bread, because the butter was just so yummy. I was asked if I wanted more butter, and I'm sure you know what my answer was. I even asked if I could bring home the butter. One of my dining partners, Alain, ate 5 pieces of bread please, and dinner hadn't even started! So simple, but so good! 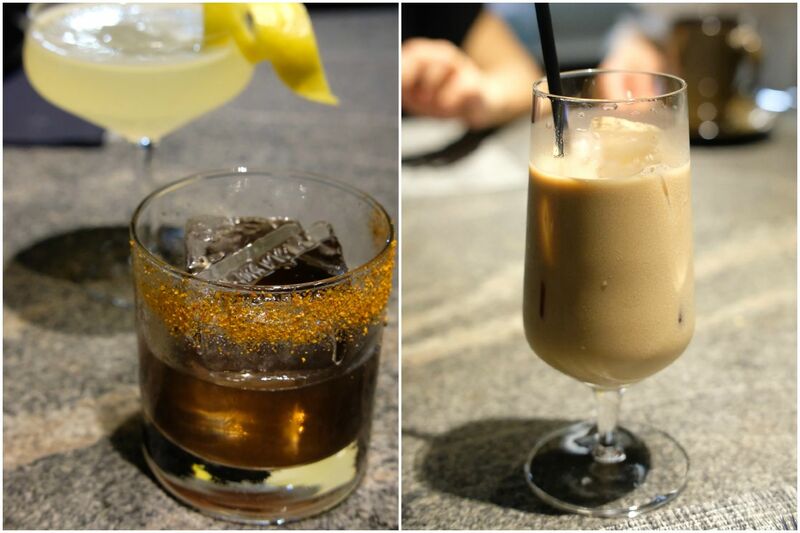 When the Uni & Cavier($25) arrived, everyone was like "woah". But when its price tag was revealed, everyone went "WOAH?!" 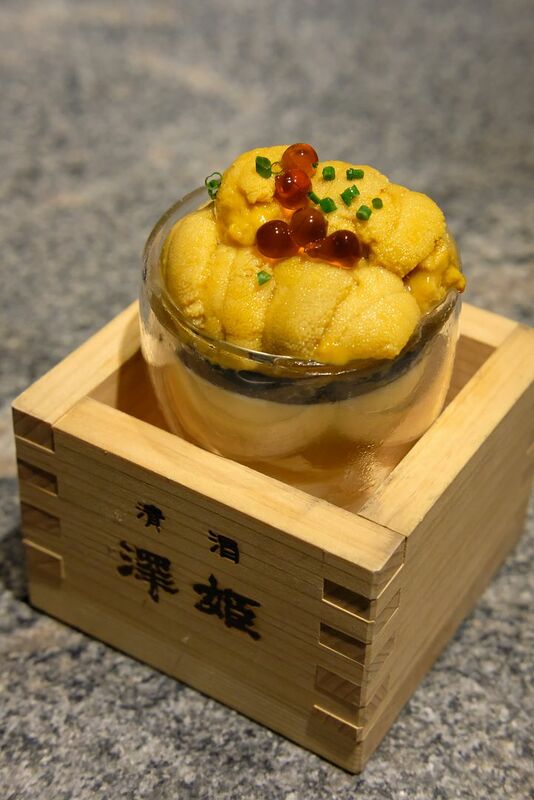 A very generous amount of wild-caught Bafun uni is perched on the beautiful ensemble that is only assembled upon order. 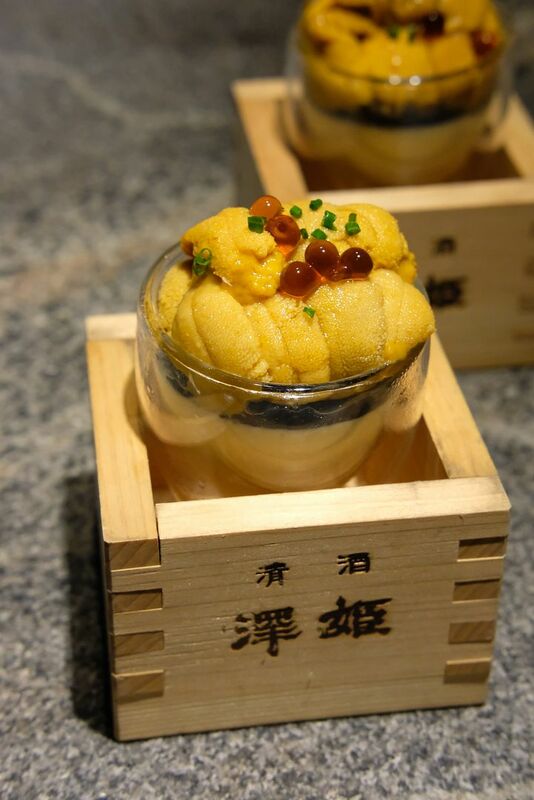 Shoyu balls, that we all thought were ikura, are sprinkled on top of the luscious uni. Just below the uni lies a substantial layer of sturgeon uni, house-smoked sea salt flakes, charred corn and a creamy corn mousse. This more-than-affordable dish is brilliantly put together — different textures, complex flavours, bursts of savouriness, all in one package. I can only say that every mouthful of this solid outfit is a small taste of heaven. The Binchotan Burnt Aubergine($12) features burnt Australian aubergine that is chilled, and served with deep-fried wild rice grains, a yogurt dressing, and a touch of Japanese chilli oil. While I finished my portion, this is not something that I'll order again as I don't eat vegetables. If you love clams, you have to get the Little Neck Clams($20). Diners can look forward to a satisfying and comforting combination of clear sake broth, vichyssoise, clams, and enoki. This is one dish that will warm you to the bones. I loved the sweetness of the fresh plump clams, and finished every last drop of the tasty broth! Does this look like charcoal to you? Well, it's an Edible Charcoal($23)! The tedious and painstaking cooking and preparation process is certainly worth the while. Encased within the thin crispy folds of the "charcoal" is wonderfully tender and delicious Angus beef short ribs that have been slow cooked in saikyo miso and port wine for 16 hours. Just imagine all the flavours that have been locked into the short ribs! Bite into the roll and you'll be greeted with a loud crackle, and moist delicious pulled short ribs. The accompanying garlic Greek yogurt offers a refreshing cold contrast, and delightful creaminess, which complements the palatable charcoal roll very well. You have to order this! 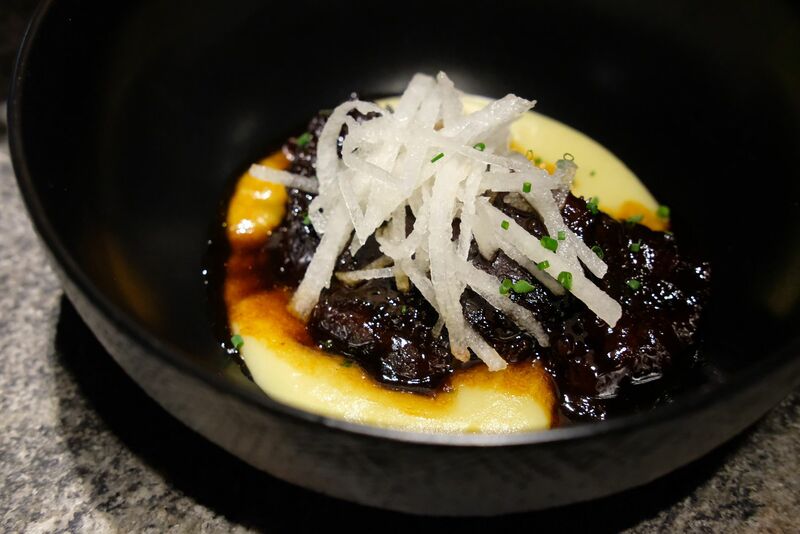 Available as one of the main course choices in the lunch sets, the Australian Braised Beef Cheeks(from $27) which are braised in Japanese shoyu and molasses sugar for 2.5 hours, and served with mashed potato, vichyssoise, and nashi pear, will wow you with its amazing tenderness and robust flavours. If you're here for their value-for-money lunch sets, it's quite a no-brainer, this is the main course that you should be going for! 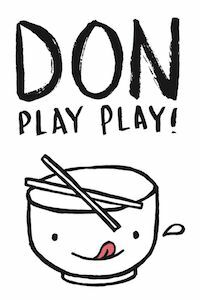 Sakura Ebi Cappellini ($27) is a dish that everyone deems easy to master. I mean, it's essentially pasta right? However, if you have had cappellini elsewhere, whether cold or warm, you will know that it's not that easy to get the pasta right. I'm proud to report that the cappellini here rocks an al dente texture, which is consistent throughout. 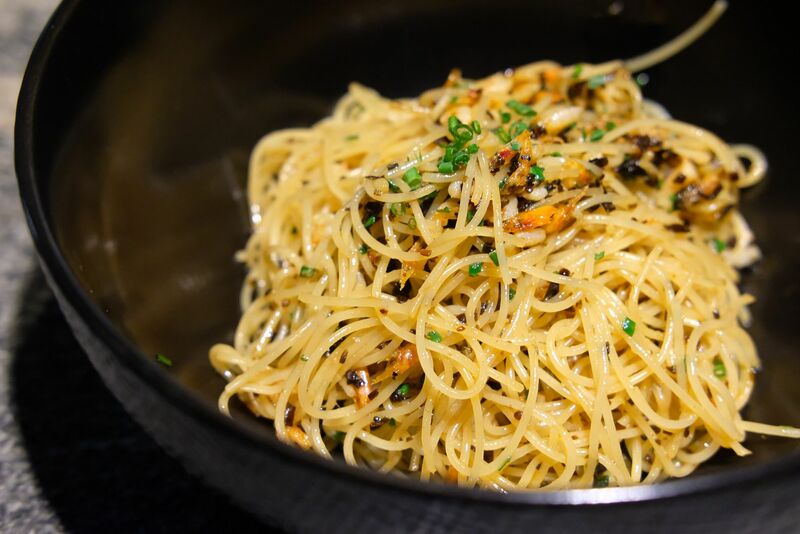 A mix of simple ingredients such as shio kombu, butter, chives, and sakura ebi are tossed with the cappellini, and there you have it — a gratifying bowl of pasta that will be polished off in no time. The Char-Pork Jowl ($35) may come across as a tad pricey but one thing I've learnt is that we are not just paying for the ingredients or portion, but also the amount of effort, time, and dedication placed into the execution of the dish. Pork jowl is first marinated in dried chilli, thyme, rosemary, cloves, star anise, Japanese curry powder, and a little rock salt, before it is confit in duck fat and whole garlic at 140 degrees celsius for 3 to 5 hours, and grilled on binchotan. Even the curry sauce, which carried a fine balance of sweetness and light spiciness is meticulously crafted from sauteed garlic and shallots, white wine, curry powder, mashed green apples through multiple steps. Finally, the dish is served with thinly sliced nagaimo that's been baked, and fried to achieve a crispy crust. We will never know the amount of effort and time placed into the preparation of a dish, unless we ask, so I guess maybe we should all learn to see and appreciate that! 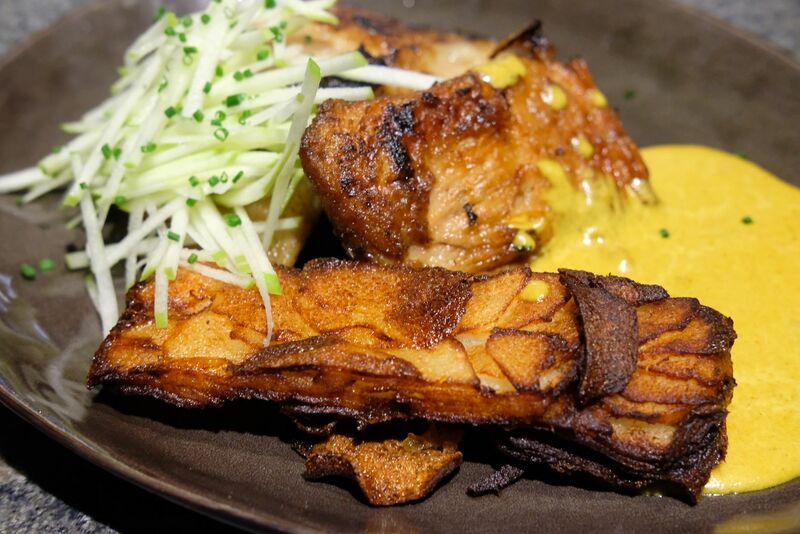 I enjoyed the crisp and crunch of the pork jowl, and how it's paired with a yummy curry cream and sour apples. I was too full or I would have snagged another portion of it! 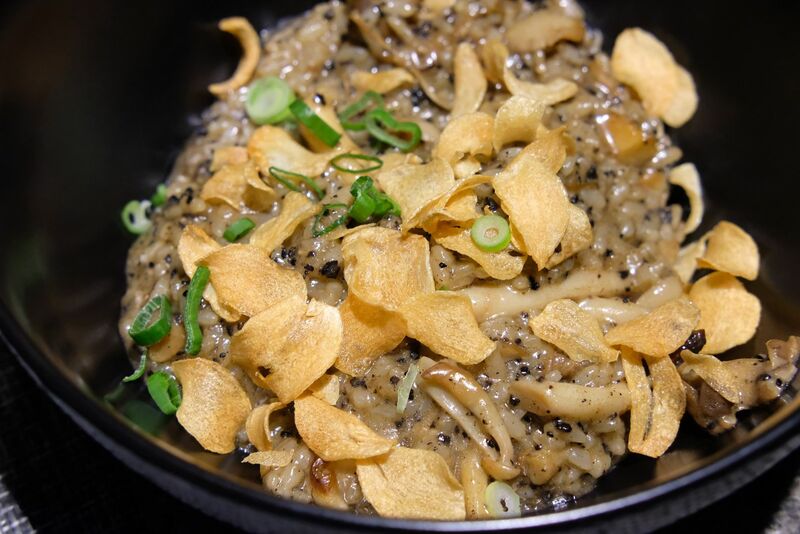 The Mushroom Risotto($29) might not be anything unusual, since it's a common item on many menus, but the mushroom risotto here is created with so much love. Chef Jeremmy's son loves it and it's a waste to not place a perfected piece on the menu, isn't it? 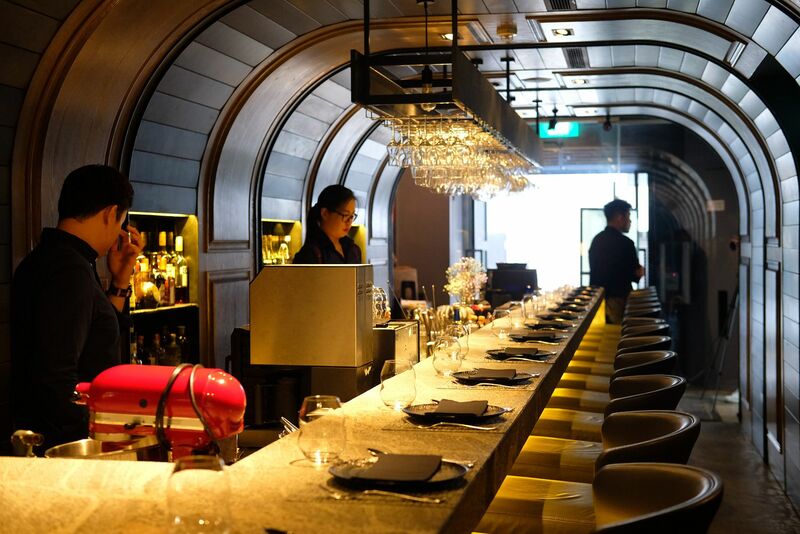 You might not expect the risotto here to be awesome, since Le Binchotan isn't an Italian restaurant, but it definitely ranks among one of the better ones that I've had in Singapore. The rice possessed just the right texture(not too hard nor mushy), and even though the grains are covered in a creamy sauce made from truffle jus and truffle paste, the dish is not overwhelming, and you don't get sick of it. Sprinkled lavishly with garlic chips, the risotto was chock full of mushrooms. The entire dish was perfumed with a strong aroma of truffle oil, and it captured my attention before it even got to me. I really enjoyed it so much, that when I was offered a second portion, I didn't have to think twice before saying yes! 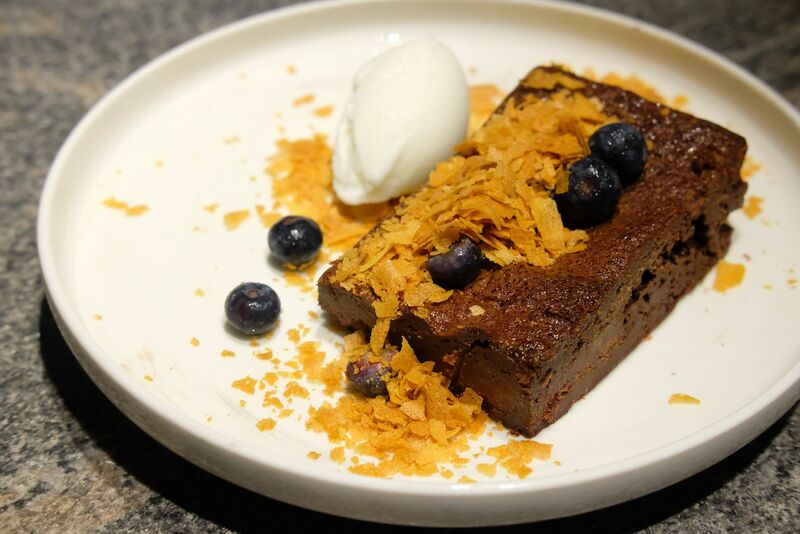 The Cold Smoked Chocolate($15) is one of the most highly raved about items at Le Binchotan, and very rightly so. The slab of chocolate is like a super super dense flourless brownie. 64% Valrhona dark chocolate is cold-smoked with apple wood, then melted with butter, loaded with whisked eggs and sugar, before it is baked for 40 minutes. Once the chocolate is cooled, the cake is left in a smoke-filled airtight container until needed. The intensity of the chocolate and smokiness really left an impression. Super rich melt-in-your-mouth chocolate paired with a lovely scoop of yogurt sherbet and a big sprinkle of crushed feuilletine, what's not to love? This is every chocolate lover's dream. cake is left in the smoke-filled airtight container until needed. Say hello to the Matcha Lover($17), a cheery dessert with an eye-catching frozen apple that's made with white chocolate, matcha, and red bean paste. The apple comes with a house-made red bean ice cream, and crushed feuilletine. I didn't try it as I don't take both matcha and red bean, but it seemed to be pretty popular among my dining partners. Le Binchotan is one of the few restaurants that I'll visit again, and again. It's also definitely one of the few that I'll always recommend to anyone who asks for recommendations. If you haven't dined here before, it's time to make a reservation. I hope you love the food as much as I do!